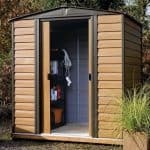 This is a great storage shed for a small garden, or to fit onto a patio area, as it offers a reasonable storage capacity at a very reasonable price. It’s not the tallest shed, so you’ll have to bend down to walk inside, but the sliding double doors allow you to easily store and retrieve your gardening equipment. 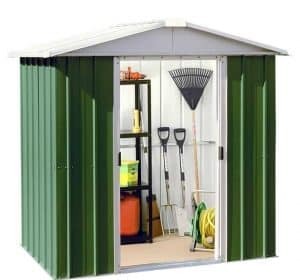 We really liked the green colour scheme of this shed, meaning that it won’t stand out obtrusively like some metallic garden buildings, and so of course you’ll want to keep it looking good and rust free. That’s why it’s good news that all of the steel cladding used has been galvanised using the hot dipped method, including the roof. This is vital in the fight against rust, and is one reason that the shed carries with it a 12 year guarantee. 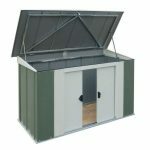 Easy to erect, this shed is designed to be installed directly onto a concrete base, and comes will all the fixtures and fittings needed to enable this. It also, however, includes a floor support metal frame kit. This enables the owner to put down a timber floor, with the support and elevation it needs, if they prefer a warmer and more traditional look. The first thing that struck us about this metal apex shed was its colour scheme. 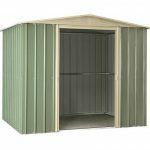 Primarily zinc and silver coloured sheds can look incongruous in a traditional garden, but thanks to its subtle green tone this will really fit in. We were especially pleased to see that it had been both galvanised and painted inside and out, as this protects the interior from the knocks and scrapes that sheds are often susceptible to. The apex itself is quite pronounced, which means that it swiftly carries water harmlessly away, keeping the interior safe and dry. The ridge height is 1.89m, with an eaves height of 1.63. It would have been nice to have the eaves at a higher level, as this would have given more storage space and made it easier to move around. The overall width of this shed is 2.02m, and the overall depth is 1.37m. These are the measurements you need to take a note of when finding a suitable location to use as a base. We were pleased to see that hot dipped galvanised steel is used for all of the cladding, including the roof. This means that although the metal is lightweight and only 0.35m thick it is very water resistant, and provides a tough and stable structure when erected. The process works by dipping steel into molten zinc, a bond is formed, and the resulting metal is very resistant to corrosion. 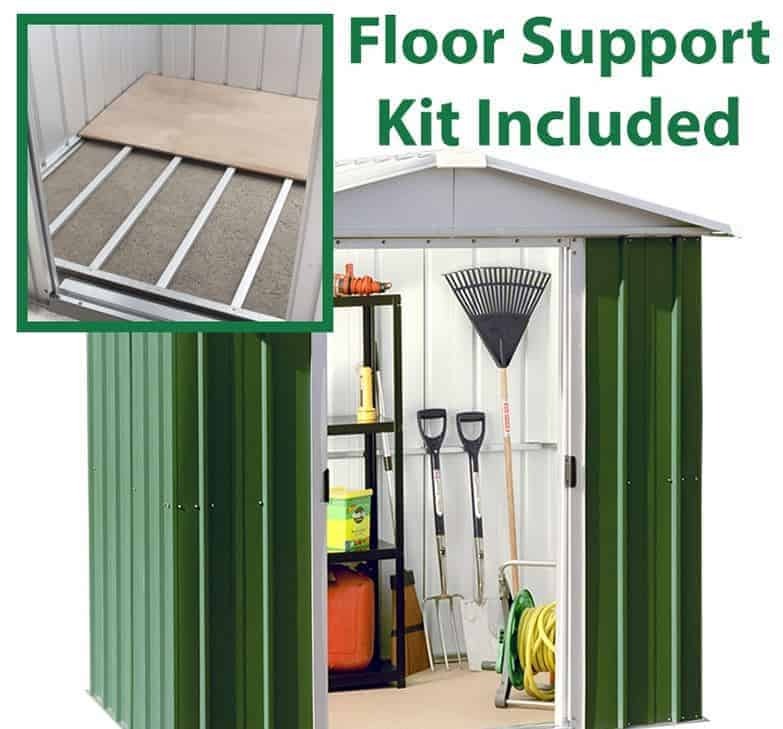 No floor is included as standard, which is to be expected on metal sheds that are designed to be erected into pre-existing concrete, but a timber floor support kit is supplied. This allows you to create a timber floor that is stable and elevated above ground level where moisture can form. No timber is included with which to create the flooring, but decking boards can be used as a low cost flooring solution. Because the cladding had been hot dipped galvanised, we expected the manufacturer’s to back this up with a lengthy warranty against rust, but we were still pleasantly surprised to find the cover lasting 12 years. Many metal sheds in this price range are covered for only 10 years, so the extra two years provides extra peace of mind, a priceless commodity. As always with metal sheds, the only treatment required is keeping it clean and free of algae, which will be a welcome change for people who have been used to wooden sheds. We found that there were pluses and minuses to this shed’s double doors. On the plus side, they are internally fitted so slide neatly and easily open, and they have a width of 0.79m. 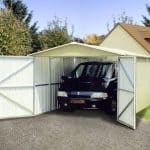 This makes it easy to manipulate larger objects into the shed, a bicycle for example, but is offset slightly by the low door height of only 1.58m. This mean that we really had to stoop when entering the shed, although it was roomier once inside. There are no windows to the shed, so it’s a good idea to have a torch situated near the doorway. The lack of windows adds to the overall security of the shed, as it stops passers by or would be thieves from seeing what’s inside. This potentially makes it more secure, but is offset by the lack of a padlock or secure locking facility. The door handles are, however, holed and ready to accept a padlock so this is a smart accessory to purchase at the same time as the shed itself. As mentioned above, we would highly recommend purchasing a padlock, even though the windowless design will put some opportune burglars off the idea of trying to break in. Unfortunately a padlock and alarm system isn’t available to buy directly with the shed, but they can be found cheaply elsewhere. Accessories that are available include a resin shelving unit, featuring four shelves, and a wheel mounted tool rack. 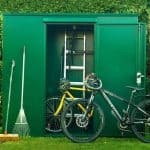 We like both the appearance and functionality of these items, as without the organisational aid that they bring, it’s easy to end up with a shed that’s chaotic and difficult to locate anything in. We like to check the little things when reviewing sheds, as they can sometimes give the best indication of overall quality. That’s why we were delighted to see that even the screws were rust-free and made of stainless steel. The 12 year warranty shows how effective the galvanisation process is, although it could have been even more resilient if the cladding was a little thicker. 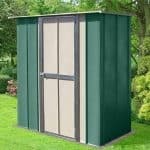 Whilst this shed is slightly wider and slightly deeper than many of its competitors, it was also a little shorter so may not be the best option for tall gardeners. The instructions were easy to follow, and we particularly liked that all the fixtures and fittings were included. If you and a friend are working on the assembly, expect to have it completed in around four hours. 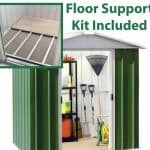 The little extras such as the long warranty, and the inclusion of an anchor kit, can save the customer money, so this represents good value for a small shed. 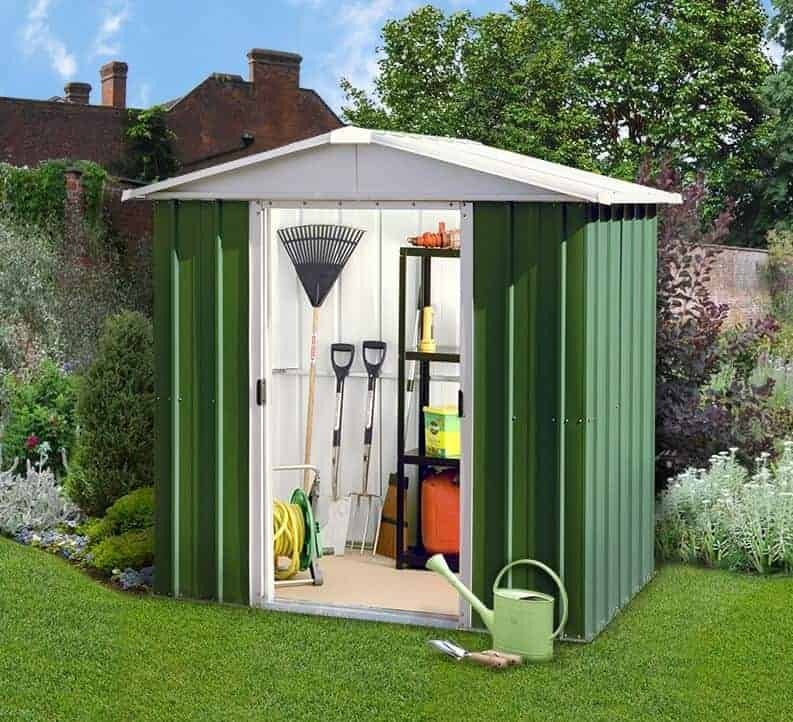 Final Thoughts: This shed can prove to be a very useful storage facility, enhancing your enjoyment of the garden, especially if the optional resin coated shelving storage unit is purchased at the same time. The double doors provide easier access than the entrances found on many other metals sheds, and can easily be secure with a padlock, although no padlock is included as standard. We really liked the look of this shed, the paint itself seemed expertly applied, and for such thin cladding it felt stable when assembled. With rain running away thanks to the apex roof and a 12 year guarantee against rust, your favourite tools will be protected against the elements.